Add your voice to the sound of the crowd” – The Human League, The Sound of the Crowd, 1981. Blue is the color of the unreal, of the memory, of the open mind, of the royal, the precious and the rare. Blue is the color of the absolute, the higher, the divine, of cold and of clarity. It is the color of Yves Klein, Derek Jarman, Picasso and Gerard David. 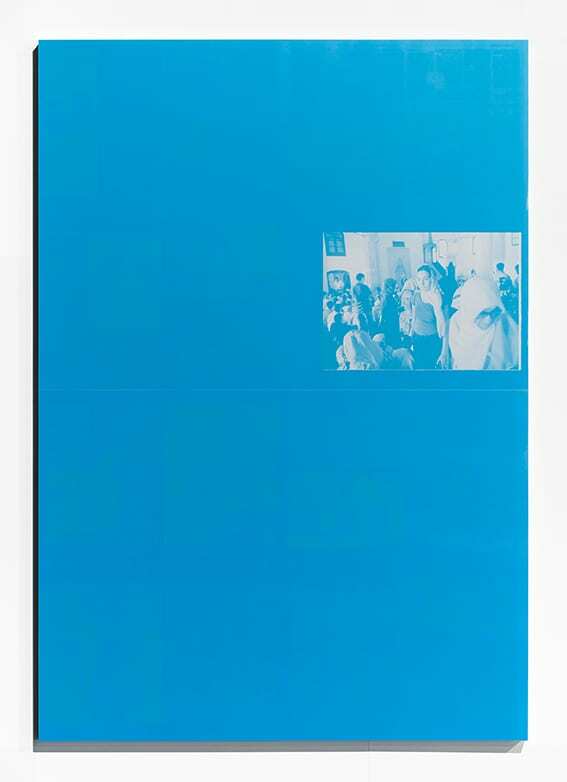 Blue – cyan, to be precise – is also the color of Emmanuel Van der Auwera’s Memento (2016), an ongoing, growing series of offset newspaper panels mounted on aluminium. 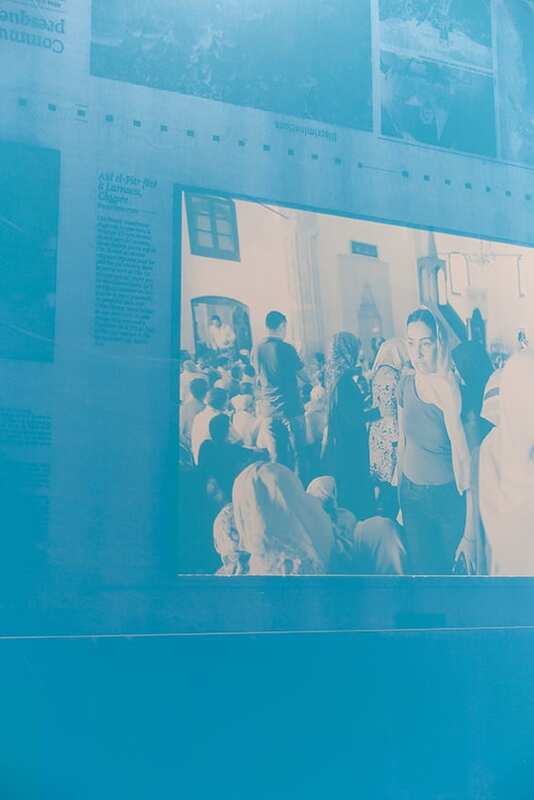 In commercial offset printing (used for brochures, magazines and newspapers), information that is invisible to the human eye is transmitted to an aluminium panel with a computer controlled laser beam. The CMYK colors are then printed in four stages. Van der Auwera visited local newspaper production plants during the 24 hours after a collective catastrophe. 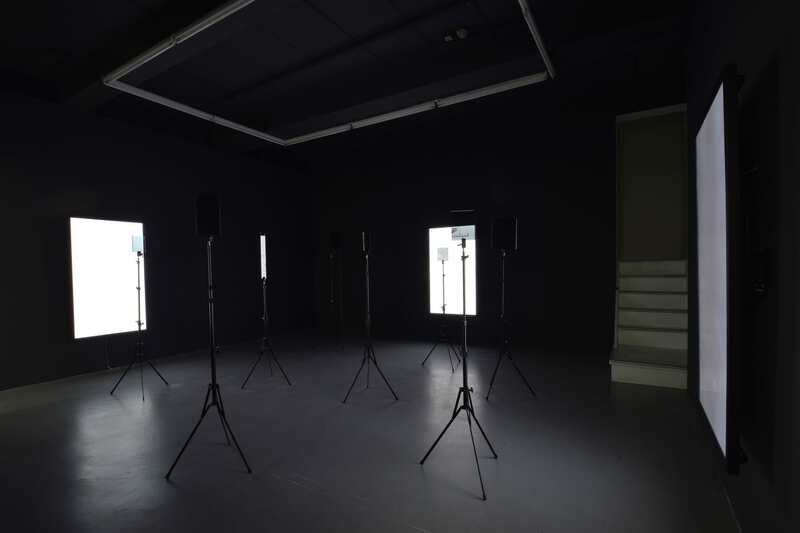 He removed the exposed panels from the machines, positioned pieces of cardboard on the sequences he thought to contain images and added white light. 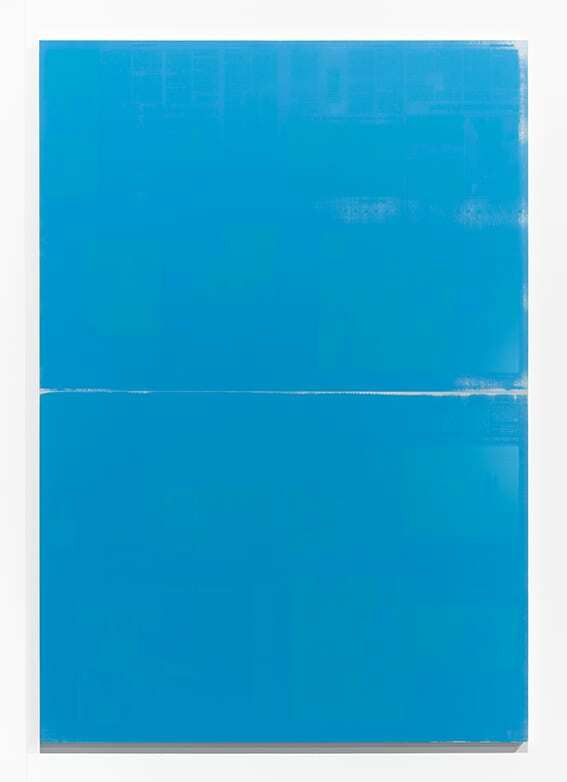 The unprotected areas of the panel turned cyan, the white neon light of the space burned itself into the panel in only a few seconds, leaving bright white marks. Afterwards, after development, what remains are semi-accidentally ‘framed’ and cropped photographical prints. It is important to note that there are different layers filtering through the blue, remnants of the layout. These are barely visible marks of what once was – or then again, was not? 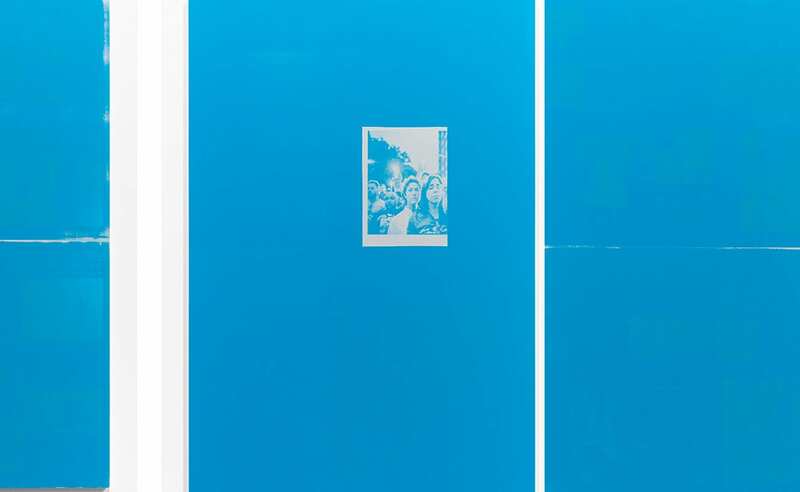 Memento builds on the artist’s fascination for the mediatized representation of the crowd. Shortly after the catastrophe the masses shroud themselves in mourning – demure postures, pained expressions, eyes locked on the ground or directed upwards, fixing to some imaginary point. Suffering culminates into a position of elevation. How do catastrophic events like these write themselves into collective memory? And in what lies the common imagination for the future? Memento creates an allegorical double Droste effect: Søren Kierkegaard’s conception of the ‘untruth of the crowd’ becomes in the media – newspapers in this case – (1) a construction that Van der Auwera interferes with. After all, publications and press arise from a process of storytelling that is co-driven by marketing; events are supposed to produce meaning, which can be turned into the subject of press publications. Not only are they a mise-en-scène (figuratively), they are part of a mise- en-page (literally). 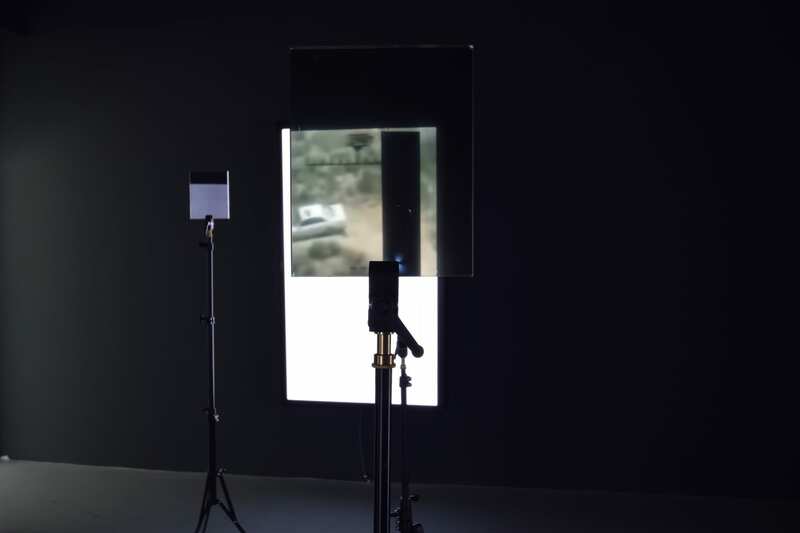 The artist’s intervention doesn’t merely create a mise en abyme, it deconstructs the situations pictured (chance plays an important part in this). Van der Auwera’s deceitfully simple intervention thus inherently reveals a sharp analysis of the automatized system of newsgathering, its processing and the inscription of all this in the cultural memento. 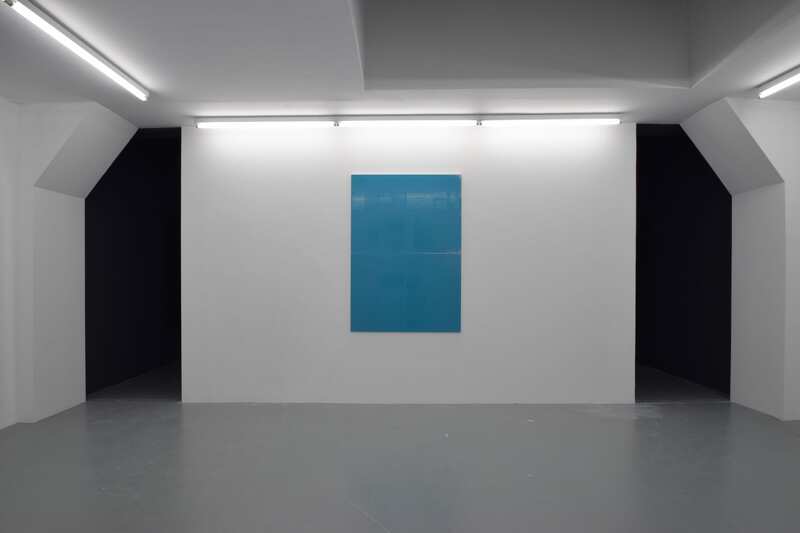 In this work the blue-out, like the blackout in cinematography, isn’t only a means to speak about the unspeakable (2). It is also a technique to appeal to the imagination. Hence, Van der Auwera opens the way to a reading that puts the tragic and the sublime on the same plane. His images don’t leave us uncertain, but on the contrary, they gnaw away at us with the lingering reminder of a simple yet often unstated abominable truth: .The fact that we do not see something does not mean it is not there. The triptych Videosculpture XII (2016) starts from the same principle, but in this case the artist reverses the formal procedure and the works are more interactive in nature. One that wants to read the message of these hellishly white monolithic screens, has to gaze through the polarising filters mounted on tripods. Found footage of predator drones and targets make the viewer painfully aware of the impact of technological developments in warfare today. The images show a dehumanized hygienism that contrasts sharply with the so-called secure, (but never effective!) surgically precise assassination operations carried out by mechanisms with particular anthropomorphic characteristics. 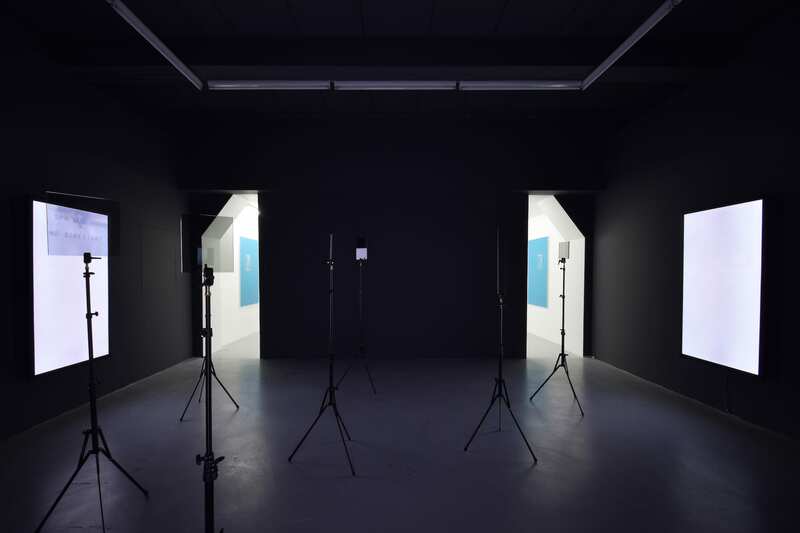 The physical installation of Videosculpture XII itself, echoes the very principle of registered action: One who would want to see the work, has to position themselves in front of a filter – the imaginary viewfinder– allowing the view to correspond with that of the lethal machine. 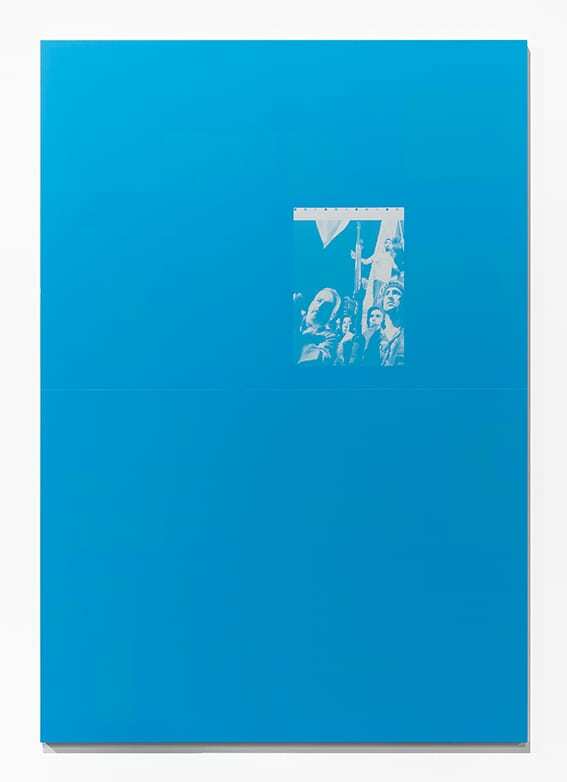 Memento and Videosculpture XII perfectly complement each other, embedding themselves into the developing vocabulary of the artist, in which power terms such as image manipulation, horror, politics, the media crisis, identity and transformation leapfrog each other in constant play. Even though the almost ‘invisible’ war of Videosculpture XII is set in a desert that somewhat reminds us of a moonscape (far far away for most Western perspectives) this choreography of death depicts our obsession to register every detail; the daily choice for suspension of disbelief over the intrinsically perverted nature of what is called reality. (1) “There is another view of life; which holds that wherever the crowd is, there is untruth, so that, for a moment to carry the matter out to its farthest conclusion, even if every individual possessed the truth in private, yet if they came together into a crowd (so that “the crowd” received any decisive, voting, noisy, audible importance), untruth would at once be let in”. Søren Kierkegaard, The Crowd Is “Untruth”, From “That Individual”: Two “Notes” Concerning My Work as an Author, published posthumously in 1859. (2) This technique is used for a variety of different reasons, such as: the impossibility of representing something, the delicate constellation ofthe collective memory, the risk of offending a singularity, “too cruel for words” and so on. Posted in Essays, Feature and tagged Allegory, Catastrophe, Chance, Derek Jarman, Don DeLillo, Emmanuel Van der Auwera, Gerard David, Harlan Levey Projects, Ive Stevenheydens, Media, Memory, News, Photojournalism, Picasso, representation, Shakespeare, Søren Kierkegaard, The Human League, tragedy, Yves Klein.